Black Panther is a cultural phenomenon. 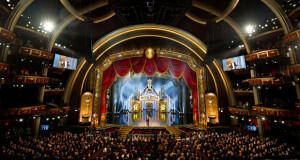 It is on track to become one of the highest grossing films of all time, having soared past the $200 million dollar mark in its opening weekend at the box office. 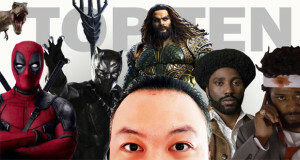 Despite the relative obscurity of the Marvel super hero character, Black Panther is going to do bigger business than any previous Batman, Superman or Spider-man film ever released. The distinctive Wakandan chest-thumping greeting is already being used by celebrities and sports stars; plus it seems like everywhere I look online, I’m greeted by the catchphrase Wakanda Forever. Who would’ve thought we’d ever be saying that about a Black Panther movie? And yet here we are. Black Panther deserves every bit of success that comes its way. It is a project that could easily have felt like tokenism but instead this is authentically a big budget, no-expenses-spared black Marvel super hero film. It has one of the most talented young directors in Hollywood at the helm in Ryan Coogler. It has one of the most talented cast of black actors ever assembled including Chadwick Boseman as the lead. Everything right down to the soundtrack (produced by Kendrick Lamar) and costume design has been arranged as a showcase of black excellence. Considering how popular and far reaching super hero films continue to be, particular to young children, its impossible to overstate how important a film such as this is, that breaks down the monolithic white face of Hollywood heroism. The reaction prior to the launch of the film speaks for itself. Far-right agitators were shaken by Black Panther‘s presence and they unsuccessfully tried to wage a campaign to harm its chances of success. On the flip side, the film generated massive interest online and had enourmous buzz in the lead up to its launch. Once the screenings began, it generated incredible word-of-mouth. Then those box office figures rolled in and confirmed just how big this thing had become. Although Black Panther exists in the expansive Marvel Cinematic Universe, it is a film that is absolutely watchable as a stand alone feature. 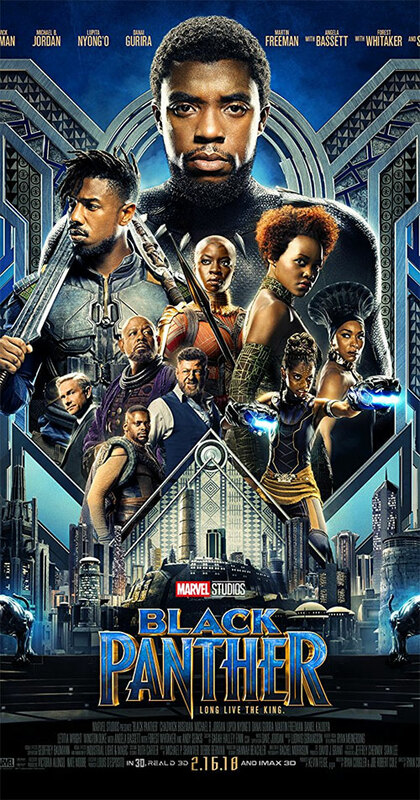 The majority of the film is set in the fictional African nation state of Wakanda, which, to the outside world, appears poverty stricken and destitute. However, the nation harbours an incredible secret. Hundreds of years ago a meteorite crashed into the country that carried the powerful mineral vibranium. The power of the vibranium is harnessed by the ruling Jabari tribe, giving the Wakandans access to incredible world-leading technology. The Wakandans create an egalitarian society where nobody wants for food, shelter or opportunity. Terrified of ever losing this idyllic utopian existence, the Wakandans shut themselves off from the rest of the world. This secret existence continues on for centuries until an explosion at the United Nations headquarters kills the reigning king T’Chaka. 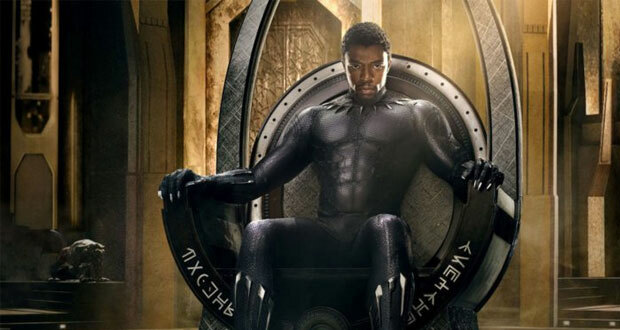 His son T’Challa (Chadwick Boseman) assumes the throne as well as the mantle of Black Panther. However, all is not well in Wakanda. T’Challa and his council sense that the sinister Ulysses Klaue and his agents may be plotting an attack on the Wakandans. That’s about as much as you need to know about the set up for Black Panther. As far as origin stories go, it’s an absolute corker. Conceptually, Wakanda is a fascinating idea and a key part of the Black Panther mystique. In the super hero pantheon, I can only really think of Gotham City as a setting that is as memorable and integral to the make up of the protagonist. Black Panther was written and directed by the talented Ryan Coogler (Fruitvale Station, Creed). In his first crack at constructing a super hero blockbuster, he absolutely crushes it. Not only is Black Panther blessed to have an incredible backdrop in the nation of Wakanda, it has one other crucial ingredient that elevates the film amongst its super hero contemporaries – a memorable villain. Erik “Killmonger” Stevens (Michael B Jordan) is the best kind of antagonist. One that has a believable and understandable motive that drives his actions. He’s not a bad guy for the sake of being the bad guy. In fact, from the moment we are introduced to his character when he accuses a museum curator of stealing valuable artefacts from around the world and basically calls them colonialist swine, I daresay many would be cheering him on. Killmonger, an American, learns of the existence of Wakanda and is appalled by their leaders. How can the people of Wakanda choose to insulate themselves, he argues, when there is so much suffering and injustice around the world? He patiently trains and waits for his opportunity for years so that he can find Wakanda, overthrow their king, and rule it as an expansionist nation that conquers and takes back land for indigenous people. Phew! That’s a hell of a narrative for a big budget Marvel feature. There is so much to absorb and enjoy about Black Panther. 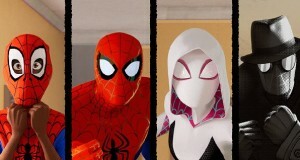 I feel like the groundwork has been laid for at least another two films and a tv series if they felt like it. The lore around the nation of Wakanda is rich and full of detail. There are multiple tribes, each with unique cultures and characteristics. Some of the tribes have hostilities towards one another. Even the tribes that have an alliance feel as though they could slip any moment if the opportunity to become king presented itself. At times the film also feels like an African super hero adaptation of Hamlet, what with the inter-family conflicts and ambitions for the throne. Black Panther also has a romantic subplot between T’Chaka and Nakia (Lupita Nyong’o) that feels like it could be fleshed out in a future story. 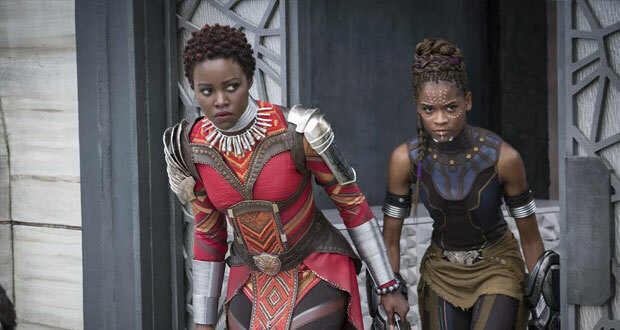 And if I’m honest, I’m already game for a spin-off production that gives the incredible array of warrior women (including Danai Gurrira and Letitia Wright) a chance to shine on their own. Letitia Wright’s performance as T’Challa’s brilliant sister Shuri almost steals the whole damn show with her assortment of technology that is canonically superior to anything that Tony Stark has produced. In short, Black Panther is a cinematic marvel (pun intended). It’s a long overdue shake up to the status quo and just like Wonder Woman last year, it carried a huge burden and had plenty of people who would have happily seen it fall flat. But Black Panther is a resounding success story. It is a satisfying super hero origin story in its own right but there is also plenty of material there to warrant future trips to Wakanda. After its incredible success at the box office, I feel comfortable that it has paved the way for a more diverse and inclusive Marvel Cinematic Universe in the future. One that reflects the diversity of its incredible global following. T’Challa, the King of Wakanda, rises to the throne in the isolated, technologically advanced African nation, but his claim is challenged by a vengeful outsider. Summary : It arrived saddled with huge expectations and somehow surpassed them. Black Panther is a fantastic film that will be revered by a generation of young viewers that finally get to see an onscreen hero that looks like them.